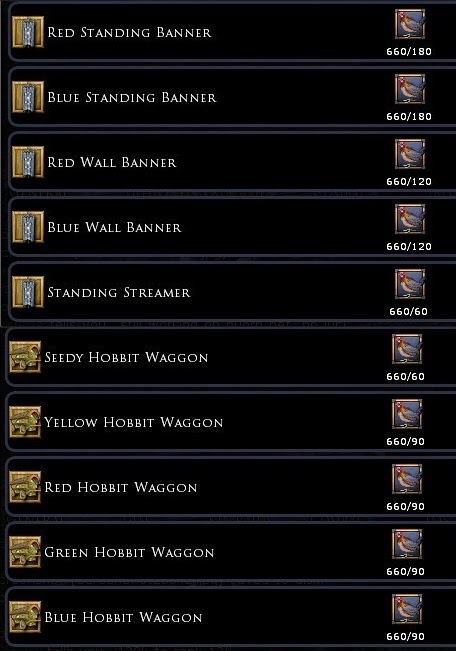 This year is flying by... while I have read that lotro is not putting out "major" new content soon, I am very content with that as I can barely keep up with the minor content updates. Fangorn? Yes!... 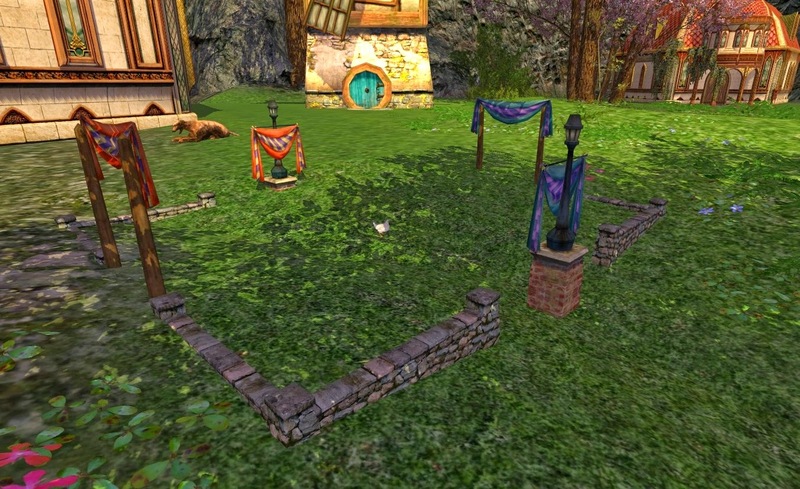 it is an update, but I think it came out the same week as the Anniversary festival, then as I was getting ready to go toward Fangorn, I got drawn in to a few raids and other activities, not to mention that the stat calculations were changed and I spent time playing with "new lotro math", plus there were new quests in Trollshaws to see (yes, they were for level 40-ish but I don't pass up any quests ever), and then along came Hobnanigans! 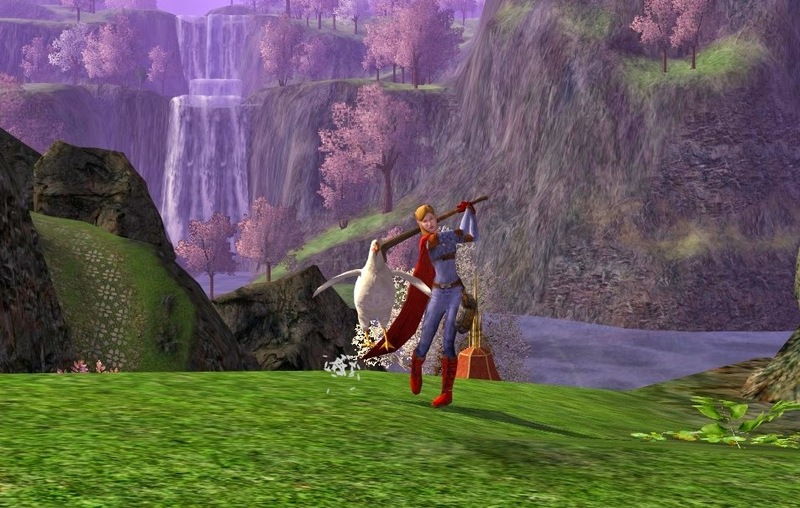 I will get to Fangorn eventually, but I wanted to recap some of the fun from Hobnanigans. It will be a short duration mini-event that pops up periodically (One rumor I read was a few days each month; we shall see). So, in short, it is a game of soccer (or hockey) where your team tries to boot chickens into the opposing goal. The game is setup to be 3v3 or 6v6. The field for 6v6 is slightly bigger than the 3v3 field. There were a few glitches that I'm sure will be worked on, but overall, it was addicting and lots of fun. It had some neat loot to barter also. I didn't get many good pictures while playing, but here is one where the Game Hen (the chicken ball) decided she had enough and flew up and refused to come down. That did seem to happen a lot, especially during 6v6, undoubtedly something to be worked. Regardless, it was still fun hanging out with friends doing something that didn't involve dire situations saving the world. 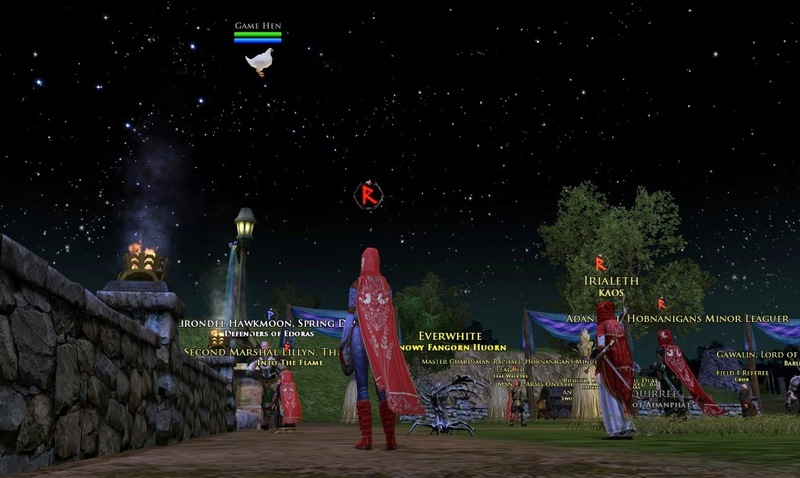 You can see that a few friends and I were in Red (see the R above the heads and the added red cloaks). Pet Chickens: Here is the chicken pen for chickens that can be bartered. There are six of them. 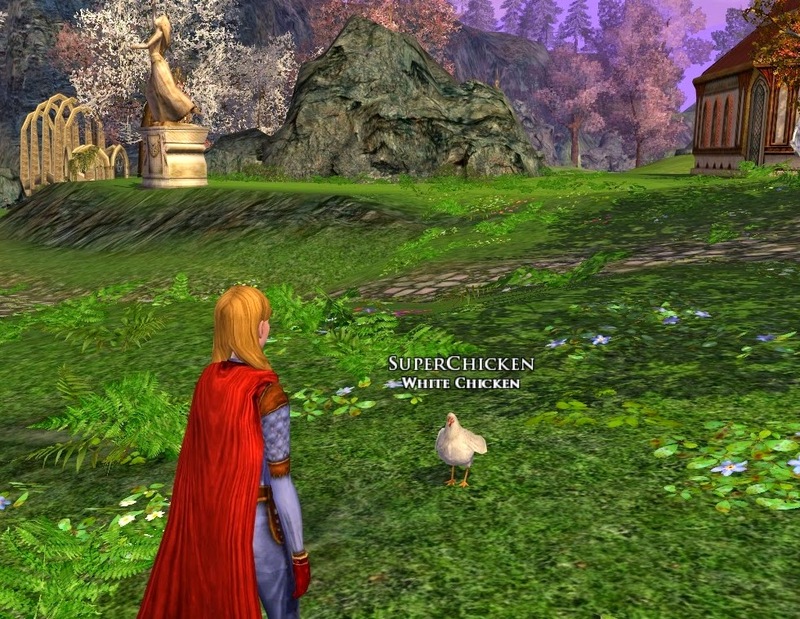 Ok; the white chicken is reasonably easy to get. I won a couple of white chicken tokens plus enough Hobnanigans tokens to get that one. Friend Lyn also won a Red Chicken token. 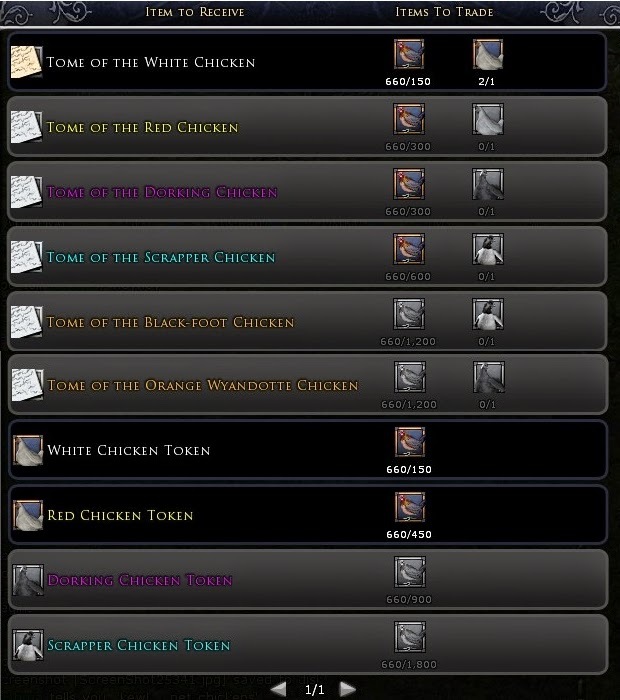 I didn't see any of the more "advanced" chicken tokens and clearly, this weekend wasn't enough for me to barter a more advanced chicken as the prices were fairly high. 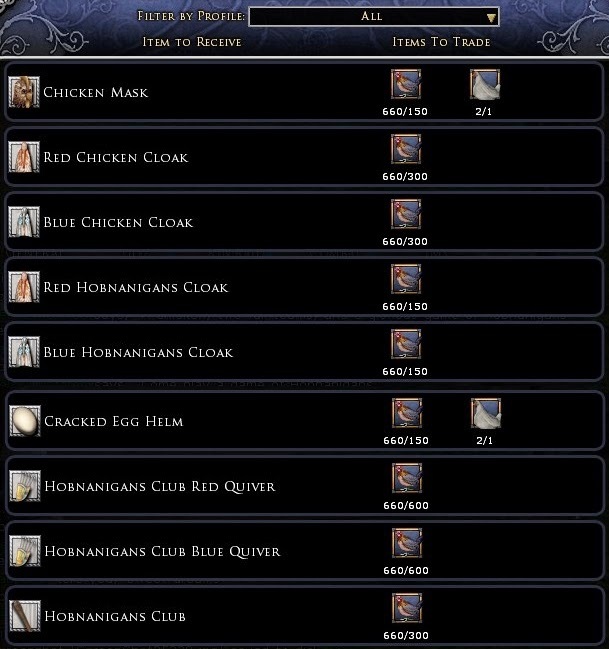 Cosmetic Egg-quipment: There were a few cosmetics that could be bartered. I'll always get all of the festival outfits and put them in our vault but given the other goodies to be had and my limited token supply, I passed on all of these. Here are the barter prices. Chicken Housing stuff: There was lots of Hobnanigans housing stuff. There was so much I missed taking screenies of page 2. Here are several views of stuff. 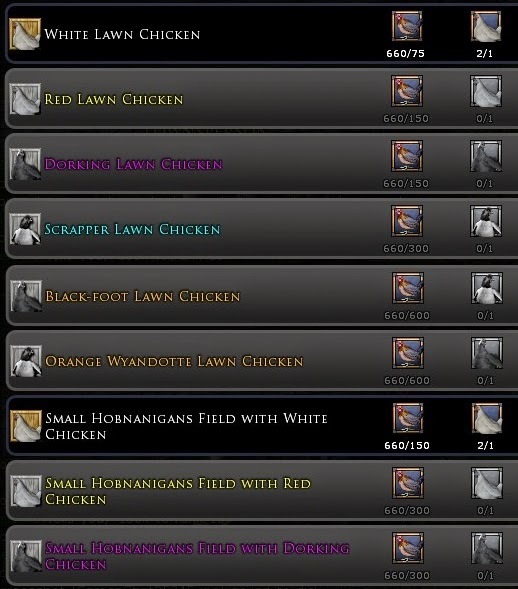 I went with the most I could afford and got the Small Hobnanigans Field with White Chicken. It looks neat. :) Here is the field sitting at my house. You can gauge the relative size of it by the size of my guard dog sitting behind it. It fits a "Large Yard" space. 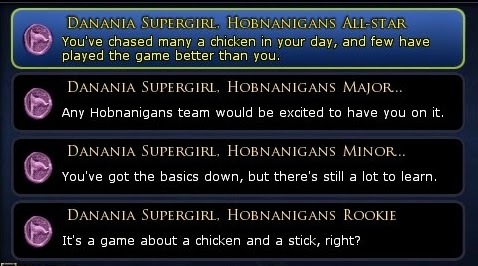 Hobnanigans Emotes: The chicken pet and the miniature housing item were good, but what I really liked were the Emotes. I will probably attempt to barter more emotes next time. There were a total of five emotes to be bartered. 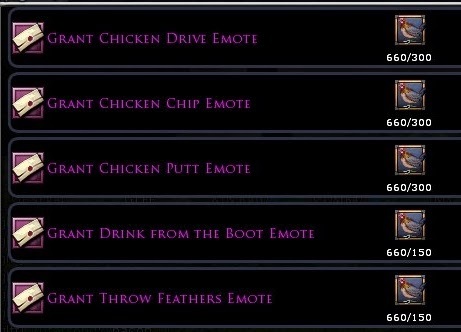 I got the "Chicken Drive" Emote. 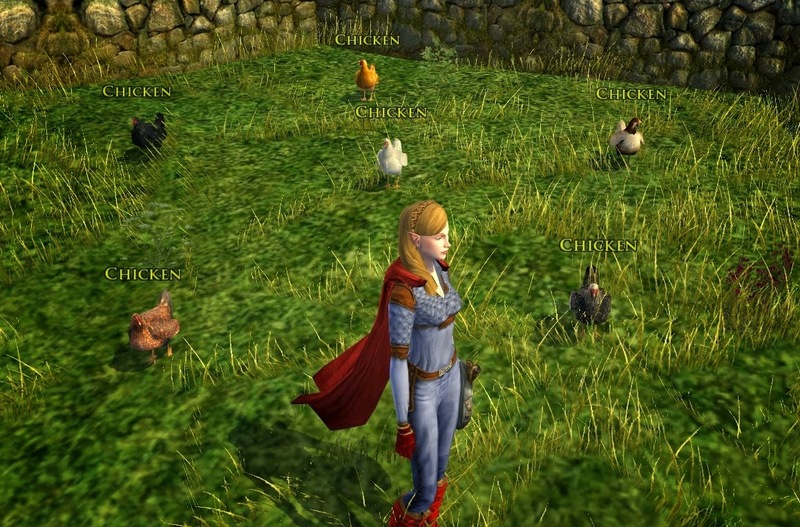 Here is a shot of me whacking chickens at home in Falathlorn. Good times. Deeds and Titles: There are titles associated with deed reputation level. Top it out to become a Hobnanigans All-star. I am definitely looking forward to playing again with friends and making new ones at the next Hobnanigans Games. Keep a look out! Awesome work with your progress on this season of chickenball. I found it enjoyable enough, but only played a couple of games before I went on my merry way. 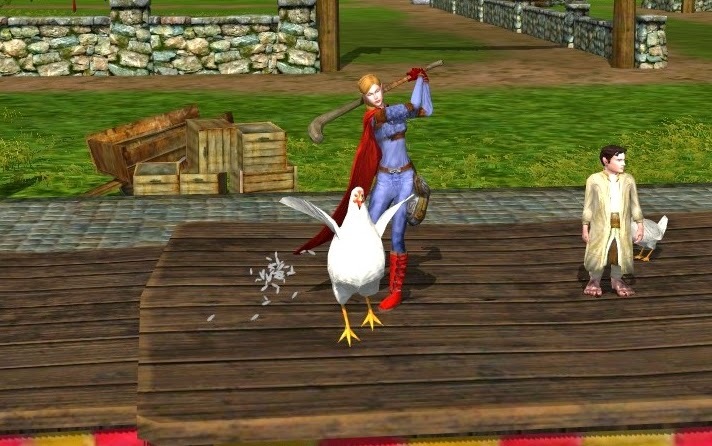 Now if only the chicken could be played by a session player, who acts as a third party trying to keep from being swatted around in the first place! Yay Hamelle! Thanks for stopping by! How much reputation points are needed for the All-Star title? Good question Eteocles. The Rep points needs are the same as all other factions. So, the total amount needed to go from nothing to All-Star (I think) would be 85,000 points.